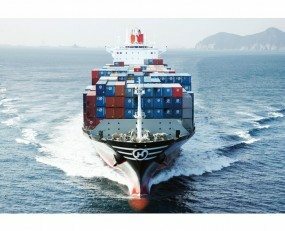 The South Korean government has reversed its previous policy and resumed financial support for the Korean shipping sector, making a major investment in the South Korean container shipping company Hyundai Merchant Marine. The government of President Moon Jae-in had promised during his election campaign last year to support a part of the economy that had suffered considerably from the competitiveness in the shipbuilding sector and the collapse of Hanjin Shipping. To do this the government created and part-funded the ‘Korea Ocean Business Corporation’ in July this year. The objective of this organisation was to pull together various state-backed financial institutions to provide finance for shipping lines and shipbuilders. One of the first actions of this organisation was to give HMM Shipping a new credit line of approximately KRW1 trillion (US$750m). It has now backed this up with KRW6.15trillion (US$5.4bn) worth of long-term financing for the company. It is unclear what the terms of this funding are, however it appears to be linked to HMM’s order of 12 new 23,000-TEU vessels and 8 new 14,000-TEU vessels, all from South Korean shipbuilders. In addition, the Korea Ocean Business Corporation is offering a further KRW138bn (US$121.9m) of finance to support other, smaller South Korean lines such as Korea Line, SK Shipping, H-Line Shipping and Polaris Shipping buy new vessels from Korean ship building yards. The Korea Ocean Business Corporation estimates that the financing should result in order for another 36 ships including four container vessels. The policy of the new government is a contrast with the previous Korean administration’s tougher attitude towards Hanjin Shipping. The state investment banks refusal to roll over maturing bonds was key to the collapse of Hanjin. The new approach of South Korea is not unique. Most notably the Chinese government has poured money into COSCO in order to encourage it to both expand its fleet and to increase its investment in container terminals as part of the ‘Belt & Road’ programme. Such behaviour suggests that the flow of new container shipping capacity is unlikely to be constrained by economics over the long-term, with the consequent implications for container shipping rates.